At LGI the following morning we both felt sick as we waited for the consultant to see us. Finally we were called in to the room and I was in tears before I’d even got onto the bed to be scanned. We explained what we had been told and then the scan began. Amazingly the fluid levels had risen slightly. Afterwards we were told that there was now a very small but significant chance that we could have a healthy baby. Dean mentioned 50% but the consultant immediately said no it was much lower than that but there was a small chance. On hearing this our decision was made. We would continue with the pregnancy, I would be on bed rest for the remainder of the time and we would return to Pontefract the following day to put a care plan in place. We left Leeds feeling slightly more positive although we knew we had a testing time ahead of us. At Pontefract the following day it was decided that I would attend the day unit twice weekly for blood tests and swabs to screen for infection. I would also have fortnightly scans and consultant appointments. The next several weeks were one huge long scare. A week after making all these decisions I began to bleed and was admitted to hospital. We were shown around SCBU, given steroids and survival rates for a 24 week baby. After 4 days with no contractions I returned home only to be readmitted several times in the following weeks. By now I was losing fluid almost as fast as it was being produced and it was nearly always mixed with blood. I was on a constant countdown to 28 weeks as this is the stage that our SCBU accepts premmies. Before this time and I would need to be transferred. Once I reached 28 weeks I relaxed a little but when I was 29+2 I woke in the middle of the night with regular contractions. I rang labour ward and was told to get there immediately with my bag as SCBU was full and I would need to be transferred if I was in labour. On examination they found my cervix was long still and not dilated. The contractions continued though for a couple of days so I was kept in as a precautionary measure. On the Saturday I was allowed home. I was very uncomfortable and finding it difficult to walk properly. I put this down to the fact that there was no fluid protecting the baby and that meant it would be bumping against me. The contractions continued and became even more regular the following day. We were going to have dinner with my Mum and Dad at their house. It was a treat to be going to lie on a different sofa for a change! When there the contractions were 10 minutes apart but as the hospital hadn’t been worried the day before I decided not to worry either. Whilst eating dinner they became more regular to the stage where they were every 3 minutes. At this stage my Mum insisted we went straight back to hospital. On arriving in labour ward I was given a speculum examination. This is the only type of examination they will do if your waters have gone to avoid infection. The doctor said I was in labour and at least 2-3 cm dilated although he couldn’t see fully. We were both terrified. We were sure it would be another false alarm ? it was much too early for our baby to be born. The next bit of bad news was that SCBU was still full and they would need to find a cot and transfer us ASAP. This couldn’t be done immediately though as I was contracting too much and had to be given drugs to slow the labour down. I was also given antibiotics in case an infection had set in. Dean was rushing around phoning people. We didn’t even have my bag with us as we’d come straight from my parent’s house. My Mum and Dad arrived with my bag at roughly the same time as the ambulance. We were relieved to hear there was a cot at St. James only 20 miles away. We were transferred with flashing lights and sirens in an impressive 19 minutes! I was devastated that we’d had to be transferred. After spending several weeks in our local hospital I felt like I knew the midwives and was confident that I would be well looked after. Arriving in a strange hospital when you’re in premature labour is an extremely frightening experience. The first midwife looking after us did little to ease this. She just kept asking why I wasn’t asleep and gave me 2 co-codamol for the pain! I explained that I was in a lot of pain and it was only much later that I got an injection of morphine. Although this helped she was still insistent that I should be asleep. I kept saying the pains were worse and more regular but she didn’t examine me or do much to ease my worries. I wasn’t even offered gas and air! At 7.30 am the nurses handed over and the new midwife came in to see me. I told her I was in a lot of pain now and felt that I needed to be examined. She said the doctors would do this when they did their rounds at 9am. At 7.50 am I said I could wait no longer and needed to push so she gave in and finally examined me. On doing so she said the head was right there and the baby would be born very quickly. However, I still couldn’t push as she hadn’t set up and she needed to call the paediatric crash team. This all happened very quickly and with 3 pushes our beautiful son was born at 8.06am. It was only when he was born that the fear closed in on me. What if our baby had no lung tissue as we had been warned? What if he didn’t live? Then we heard a cry. I know everyone says that is the best sound in the world but it really was for us. After all this worry our baby was here and alive! 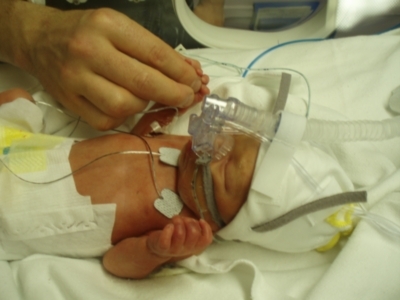 The paediatricians quickly showed us Jacob Lewis before whisking him away to NICU. He was in hospital for 52 days and is now 4 years old and is at school. The only ongoing issue with his health is asthma. He really is a miracle ... I hope someone gets some inspiration from our story. I am so sad to read about this lovely woman's awful experience with her pregnancy and the treatment she received, but so very happy to hear that her son is now thriving. And what a gorgeous boy! My friend had PROM on one of her twins at 13 weeks. She had similar discussions with consultants to yourself. She is very lucky that like yourself her little boy was born healthily (I think at 32 weeks), although due to being one of twins he has some medical hangovers including torticolisis and plagocephaly (flattened head shape). Both her boys are gorgeous and amazing though...as is their mummy. I suspect like yourself, it takes character to come through your experiences.